Not that I haven't been making ice cream year round since I got an ice cream maker, but now that summer is here I'll be making it at least once a week. Developing ice cream recipes is such a lot of fun. Even if I don't get it exactly right the first time, how bad can a "bad" batch of ice cream be?! 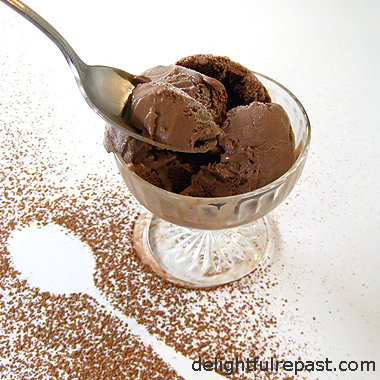 Homemade chocolate ice cream is my favorite form of chocolate, and this one is fabulous! If you want something with no fat whatsoever, make my chocolate frozen yogurt. But if you don't mind a little fat, try my chocolate ice cream. If you don't want to use Kahlua, dissolve a half teaspoon or so of espresso powder in a little hot water and use that instead. That little dash of coffee really kicks up the chocolate flavor. Unlike many, or even most, homemade ice creams, this one is scoopable right out of the freezer. And it has the superb flavor and mouthfeel of a super-premium store-bought ice cream. What is your favorite ice cream flavor? 2 While milk is heating, in 1.5-quart bowl whisk together sugar, cocoa, cornstarch and salt. Whisk in 3/4 cup of the cream and the yolks until mixture is smooth. 3 Whisk hot milk into egg mixture, then pour mixture into the saucepan. Over medium heat, stir constantly and cook until the mixture thickens and registers 170 degrees on instant-read thermometer, about 5 minutes; do not boil. 4 Strain into 2-quart bowl (I use a 2-quart glass measure to make pouring into the machine easier). Do not reuse the bowl that held the raw eggs. Whisk in Kahlua, vanilla extract and remaining 3/4 cup cream. Cover and refrigerate until well chilled, at least 8 hours or overnight. Disclosure: If pertinent to the post, I will sometimes mention a favorite piece of equipment or other product, with a link to that item on Amazon.com or other affiliate. If you purchase something from an affiliate through one of my product links, I receive a small commission that does not cost you. Once a week? What's wrong with breakfast, lunch and dinner? Ah, you meant once a DAY! Sure, I get that. A little restraint. Once a day. I can live with that. And espresso in the mix. Man, you are on a roll! So, so right about coffee kicking up the chocolate. Next thing you know you'll be rivaling Trader Joe's Coffee Blast ice cream, drunk melted from a Coke glass. As for my favorite flavor, did I mention Trader Joe's Coffee Blast ice cream, drunk melted from a Coke glass? And if you really want to enhance the effect, you have to hike deep into a forest reserve on a sweltering day with the temp over 100°, and your internal temperature rapidly exceeding that, and just before he prostration kicks in, you drop down on the shore of a lake, kick off your hiking boots and socks, and scrunch forward until you are sitting in the cool shallows, and THEN slowly sip down aforementioned TJ’s melted Coffee blast ice cream from a thermos (sorry Coke glass). 5 cleavers! Love your clever photo with the outline of the spoon in the chocolate sprinkles (Lawdy, I hope it’s chocolate sprinkles). I'm always so proud when I earn Five Cleavers from you, Sully! You'll be happy to know, too, that I keep double-strength coffee ice cubes in the freezer for culinary purposes. mmm...what a fantastic and perfect summer dessert. This looks extraordinarily creamy and smooth. Could it be the reason of using eggs here? Thanks, Angie! I am beginning to favor the recipes with eggs, though the ones without can be very smooth as well, once they've been out of the freezer about 15 minutes so you can scoop them. Thanks! And, coming from you, the compliment on the photo is especially appreciated! I love ice cream, frozen yogurt, gelato...anything creamy and cold is satisfy during these blazing southern summers. It looks like I may have to get my ice cream maker out. Thanks, Bonnie. Yes, do get your ice cream maker out and try this or maybe one of the uncooked kinds (see my recipes/reviews index page for all of them). Stay cool! That ice cream just looks luscious and decadent ... sigh. And what a great photo, with the silhouette of the spoon! Mary, thank you. I'm glad you liked the photo too! You'll find no complaints about a bit of fat from me. The world worries too much about fat content. A bit of fat in moderation is never a bad thing! Lovely looking ice-cream Jean... I'm so jealous... want an ice-cream maker myself but can't really justify buying one right now... no space! I agree! I would rather have a small serving of a nice buttery or creamy dessert than an enormous portion (that has become the norm)of the phony version. Thank you for visiting my blog, and I am glad to have found yours. You are rather tempting me to get an ice cream maker. I got a bread maker recently and it's delightful to be able to make my own bread so easily. I was put off making ice cream before because it always turned out so hard. Jenny, thank you! Do let me know when you get one - you're going to have fun with it! Ok, you've convinced me to pull out the ice cream maker out of the garage and put it into the freezer! This being 4th of July week makes it the perfect time. I even have some Scharffen Berger powdered chocolate just waiting for some use! Oh good! I hope you like it as much as we do! Thanks for the chocolate ice cream recipe. If you don't mind, can you submit your chocolate ice cream photo in http://www.foodporn.net ? Thanks, Catherine! I'll look into it. altogether right now and hope not to be chewing them in the near future. Saving your recipe for a treat...later. Judy, thank you! Don't you just love it when you can work a word like 'eschewing' into the conversation?! Don't know how this one slipped past me. I love your ice cream recipes! Don't have any Kahlua--but will pick some up. My favorite ice cream recipe so far is the Egg Nog Ice Cream---but who knows? This may top it!